Far from winding down, the numbers of U.S. soldiers coming home wounded have continued to swell. The problem is especially acute among those fighting in Afghanistan, where nearly four times as many troops were injured in October as a year ago. Amputations, burns, brain injuries and shrapnel wounds proliferate in Afghanistan, due mostly to increasingly potent improvised bombs targeting U.S. forces. Snipers' bullets and mortar rounds also are to blame. Of particular concern are the so-called hidden wounds, traumatic brain injuries and post-traumatic stress disorder that can have long-term side effects such as depression. Since 2007, more than 70,000 service members have been diagnosed with traumatic brain injury — more than 20,000 of them this year, according to the Defense and Veterans Brain Injury Center. Most of the injuries are mild but leave symptoms such as headaches and difficulty concentrating. In Afghanistan, spinal injuries have increased significantly, due mostly to the powerful explosives used in the improvised bombs that rattle U.S. troops inside heavily armored vehicles. For those injured by these bombs, recovery can mean a year or more at a military hospital like Walter Reed Army Medical Center, followed by months, years or even a lifetime of therapy and coping with disability. At least 1,800 troops were wounded in Afghanistan in the first 10 months of this year, about 40 percent of all the wounded U.S. troops in Afghanistan since the Sept. 11, 2001, terrorist attacks. Nearly 1,000 of those injuries occurred in the last three months. In Iraq, more than 600 troops have been wounded so far this year. By far, improvised explosive devices are the biggest killer of U.S. troops in both countries. In Afghanistan in the last four months, the volume of explosives used to make IEDs and the total number of IEDs have increased, Col. Wayne Shanks, chief of public affairs for the International Security Assistance Forces in Afghanistan, said in an e-mail. 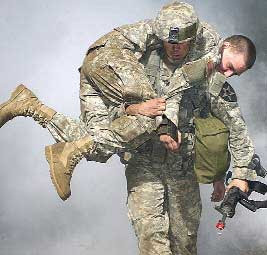 Spinal injuries account for one in six of the wounds treated in the Afghanistan battle theater, Shanks said. Of those injuries, about 15 percent involved motor or sensory changes such as a broken back or spinal cord injury, Shanks said.